While fashion loves talking about a blackface controversy, a fairly recent spread has flown under the radar. Turns out, new face, Abel Van Oeveren, was shot by Johnny Dufort and styled by John Colver, for the Fall/Winter 2013 issue of Metal magazine. 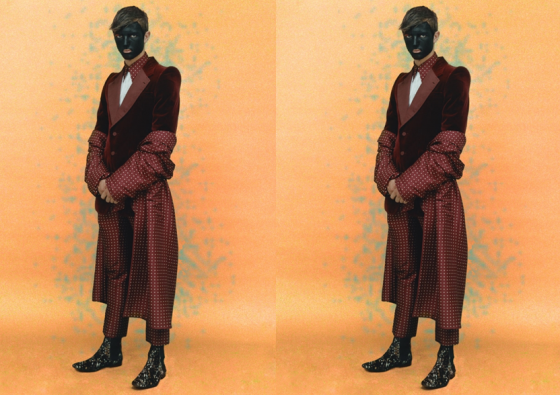 The Barcelona-based magazine's editorial, entitled "Transmission," features models Charlie Adshead, Abel Van Oeveren, Tim Dufort and Ben Dufort and one particularly interesting image: Van Oeveren with a black-painted face. The editorial follows some other recent fashion industry blackface controversies. There was Milan's annual Halloweek masquerade party, which took place in October with a theme of Disco Africa. For many guests - including the fashion industry's elite - that meant jungle costumes and blackface make up. There was the highly controversial spread in Numero magazine, entitled "African Queen," starring model Ondria Hardin, who was painted black and styled in turbans. And finally, there was Vogue Netherlands' May 2013 editorial, “Heritage Heroes”, which honored designer Marc Jacobs’s work with Louis Vuitton as styled on models in blackface makeup. Much like Native American headdresses, this seems to be one theme that fashion continues to utilize despite the negative backlash that will indisputably follow.